Outside of the title and the presence of Marines in the Middle East, Jarhead 2 has little in common with 2005’s Jarhead. That film from nearly a decade ago starred Jake Gyllenhaal, was directed by Sam Mendes, and was based on the best-selling book by former Marine Anthony Swafford. The “sequel” stars Josh Kelly, is directed by Don Michael Paul (of Who’s Your Caddy? fame), and appears to be based on any number of direct to video action/war movies – perhaps ones with generic titles like Field of Fire. Kelly’s character bookends the film with a voiceover that feels like it’s read from a diary, a la Gyllenhaal, so there’s that. 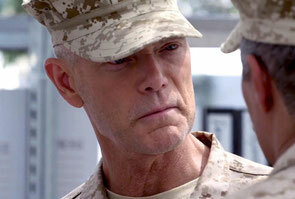 Corporal Merrimette (Kelly) is promoted to commander of his unit of supply Marines, a position he reluctantly accepts. There’s a pregnant wife waiting for him stateside and he’s not sure if he wants to renew his contract for another tour in Afghanistan. Out of allegiance to country and Corp, Merrimette leads his team, including best pal Kettner (Bokeem Woodbine) and female driver and potty mouth (and lesbian) Danni (Danielle Savre), on a mission to resupply a military outpost. After a drawn out sequence where they encounter a potential IED, the team comes upon on Navy SEAL Fox (Cole Hauser), who is attempting to get high value local Anoosh (Cassie Layton) out of an area teeming with Taliban. Merrimette offers transport to the SEAL and his charge, and when their vehicles are destroyed and their numbers dwindle, the mission turns into a long walk that’s occasionally interrupted by Taliban fighters. 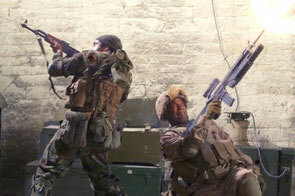 To its credit, Jarhead 2 doesn’t reduce the all-too-real conflict in Afghanistan to meaningless action movie fodder. Save a few one-liners exchanged between Kettner and Khalid (Ronny Jhutti), a member of the Afghan National Army who’s along for the ride, the film plays it mostly straight without glorifying the carnage. Unfortunately, the battles aren’t carefully constructed visually. The handful of gunfights that make up the warfare depicted here are indistinguishable and consist of several close-ups of machine gun blasts followed by combatants falling over dead, with some queasy-cam handheld sequences tossed in to fake realism. The only thing that’s memorable is when one of the wounded’s agony is expressed with a Wilhelm scream. The script from Berkeley Anderson and Ellis Black is torn between the battles and the banter, including several stretches of inactivity that are meant to demonstrate the monotony of Marine downtime, but instead are too effective in making the viewing experience tedious. Long conversations that tackle hard-hitting material like breaking up with a girlfriend are treated with reverence and go on for way too long; all of them flatly directed adding to the on-the-nose dreariness. Performances are vanilla across the board, Kelly leading the way with his overly pensive blandness. Hauser is a believable presence as the steady Navy SEAL and he’s an actor that can stand out with better material, but doesn’t have much to work with here beyond a dedication to his mission. Steven Lang pops up as basically his Avatar hardass dialed back several notches, playing a Major who coldly barks out major clichés. Jarhead 2 certainly doesn’t tap into the meditative tone of its predecessor, and plows ahead with a Point A to Point B narrative that never gains momentum. It’s not a complete dereliction of duty, just a painfully perfunctory one.